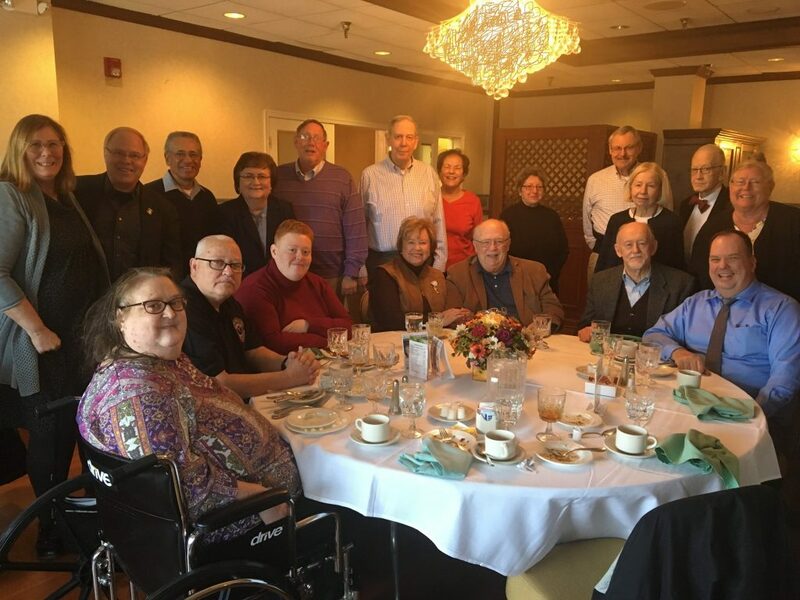 Friday, 25 January 2019 was the “kick-off” meeting of the Washington DC-area Chaplain Corps network of chaplains, chaplain assistants (RAS), DREs, DA Civilians and spouses. Central to our start was gathering in prayer, led by David Hicks. Our agenda was to enjoy the friendship and connections together. There is a definite “afterglow” from the November 2018 USACCRA 9th Biennial Chaplain Corps Family Reunion. Many words of thanks were expressed for the National leadership and the satisfaction of teamwork to celebrate chaplain ministries and communities. 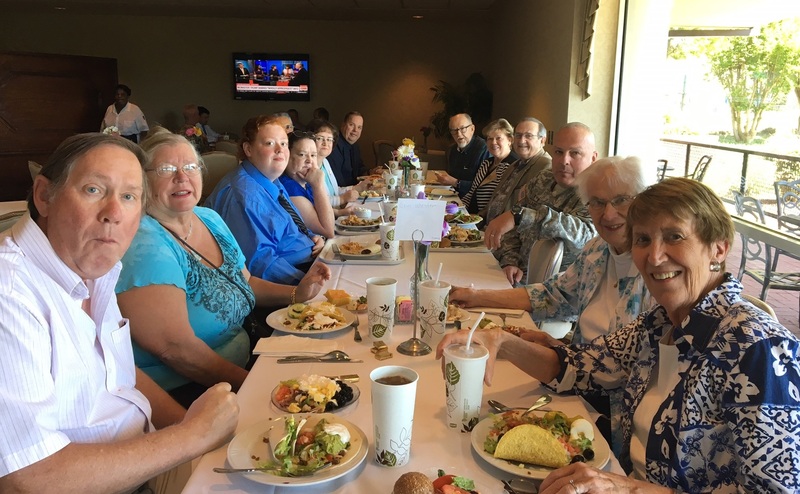 Pictured are: (seated) Connie and Wayne Ice with Wayne, Jr., Carolyn and BenChuck Manning, Bill Jokela and Randell Bowen, (standing) Paula and Eric Wester, David and Janice HIcks, Gary Dahl, Ben and Betty Nass, Renee Kilsh, Wayne Lehrer, Phyllis and Jack Marcom and Susan Dahl. We got regrets from Jeff and Monika Young, Otto Reinbacher, Bruce Burslie, Jane Heaton, Bob Chance, Dennis Madtes and Doug Lee (with late-breaking cancellations). 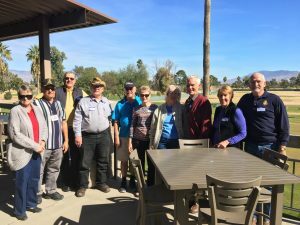 Of course, Donna Weddle is on her “western decampment” based in the Phoenix area for the winter and fostering gatherings there. Our Washington DC gathering was a time of celebration and gratitude. Looking ahead, the group determined to set the next meeting for Tuesday, 30 April at the Patton Club, Fort Myer, Virginia, gathering at 11:45 am for a 11:55 am kick-off. Also, looking toward the future, by acclamation the group determined that Chaplain Wayne Lehrer would join SGM Susan Dahl and Chaplain Donna Weddle as the DC-area planning team. This was prompted by Chaplain Eric and Paula Wester who bade farewell as Eric retires from active ministry as an ecclesiastical endorser. In February, they move to Jacksonville, Florida. Next meeting: Tuesday, 30 April, 1145 am at the Patton Club. Hope to see you there! 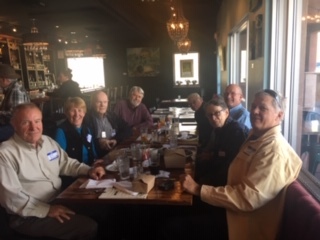 The DC local planning effort convened for the prayer (offered by David Hicks), a delightful meal and shared updates. 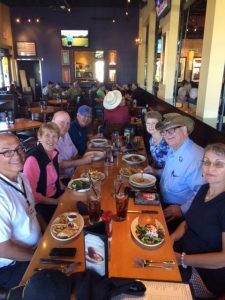 Attending were (picture 1, left to right): Donna Weddle, Jane Heaton, Wayne, Jr., Connie and Wayne Ice, David and Janice Hicks; (picture 2) Gary Dahl, Gerald Holliday, Randall Bowen, David Bowerman, Bill Jokela, Eric Wester, Jack Marcom, Susan Dahl, Phyllis Marcom, Renee Klish and Wayne Lehrer. Regrets were offered by Kristi Pappas, Sherry and Jerry Reynolds, Jeffrey and Monika Young, Mary Pullen, Timothy Mallard, Ben and Betty Nass, Ivan Ives, Jim and Justine Roberts, Steve Moon, Benchuck Manning, Dennis Madtes and Doug Lee. Stay tuned for further details about our next meeting, on-going calls for volunteers and plan to register for the November Reunion! The Arizona Chapter has held four lunches this winter, two in Tucson, one in Scottsdale, and one in Sierra Vista. Thanks so much for all who attended and helped set these lunches up. 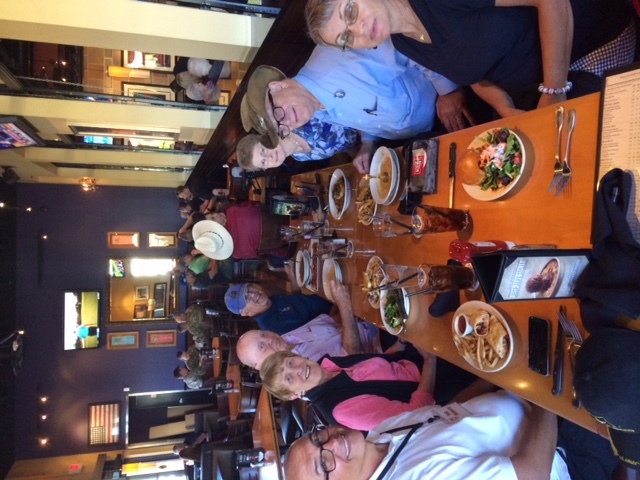 We’ve had several new participants this year and are happy that so many are able to get together with old and new Chaplaincy Friends. If you’d like to join us, or have started a new group of your own anywhere in the country, please send pictures and information to Donna Weddle dcweddle@cox.net. I’d be glad to help in any way I can. At the Fall Luncheon meeting of the DC-area USACCRA on Thursday, October 12th, we started with local plans to support the 2018 USACCRA National gathering. The biennial national gathering includes the volunteer effort with contracted support from Armed Forces Reunions. 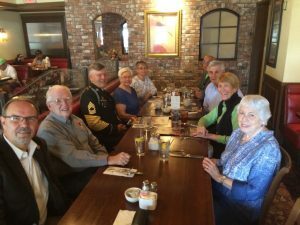 “The Arizona Chapter has had two great lunch meetings this winter and is looking forward to a third on April 7th, at Ft. Huachuca. 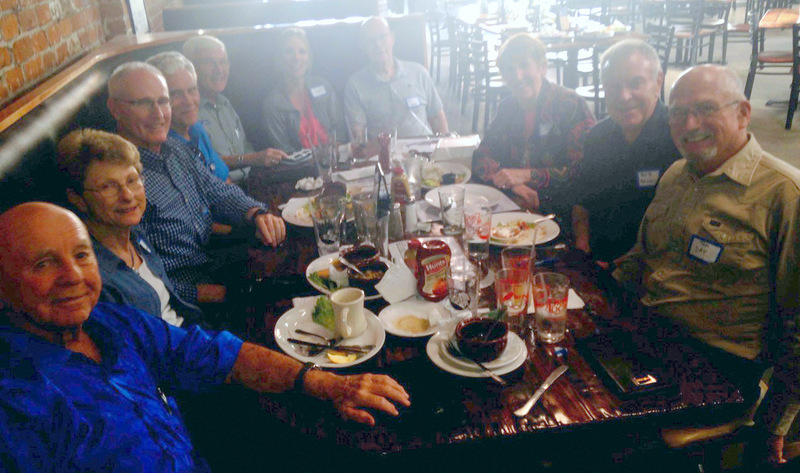 The first lunch was held at the Thunder Canyon Brewery, in downtown Tucson, on February 9th. 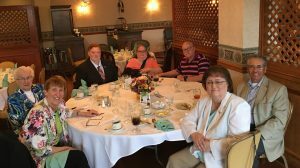 Attendees included Donna Weddle, Steve Utter, Roy Ludlow, Eugene Friesen, John Stieve and daughter Sarah, Dave Lundell, Ken and Ann Kolenbrander, Tom Day, and Bob Bendick. The picture is again hampered by all of our bright Arizona sunshine. 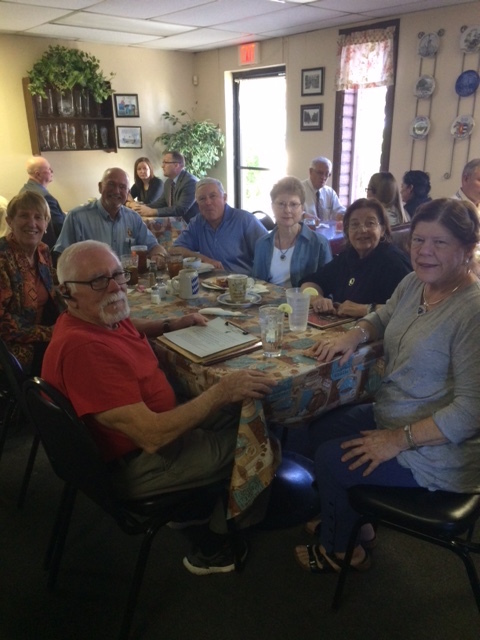 The second lunch, organized for the Phoenix/Scottsdale/Glendale crowd, was held at Mimi’s Café in Scottsdale on March 1st, with the Al and Sue DeLossa, Marion and Carol Pember with daughter Kim, John and Martha Schumacher, Bob and Sandy Flaherty, and Ken Bucy present. Thanks so much to Al DeLossa for organizing this lunch. Please edit as needed, Dan. We didn’t take a picture this time, but here is the summary of our last meeting. The East Alabama Chapter of USACCRA met Tuesday, March 28, at the Golden Corral in Oxford, Alabama. The guest speaker was LTC David Wood, Professor of Military Science at Jacksonville State University. Those attending were apprised of numerous changes in ROTC recruiting and training, as well as new issues relevant to all commanders, given new personnel policies currently in place. 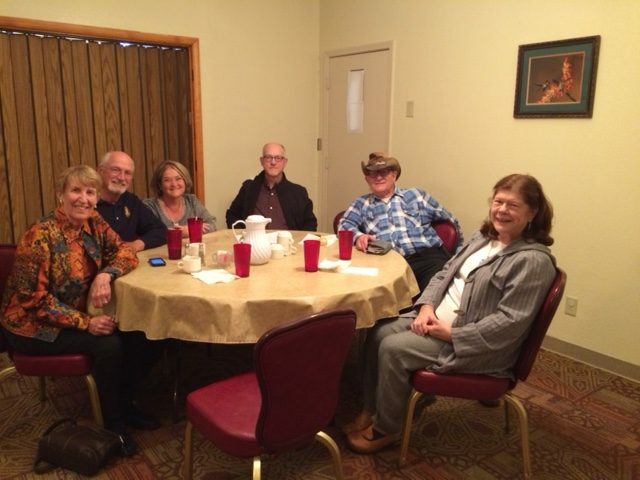 Attending were George Gray with his sons David Gray and Larry Gray, Jim Holiday, Jim Wilson, Mickey and Sandra Morton, Troy and Dianne Douthit, Hugh and Dorothy Kelso, and Tom and Carolyn Smith. The next meeting will be on June 27 at 11:30 again at the Golden Corral in Oxford. Any and all chaplaincy family members are invited. Thank you for including this article in the next newsletter. 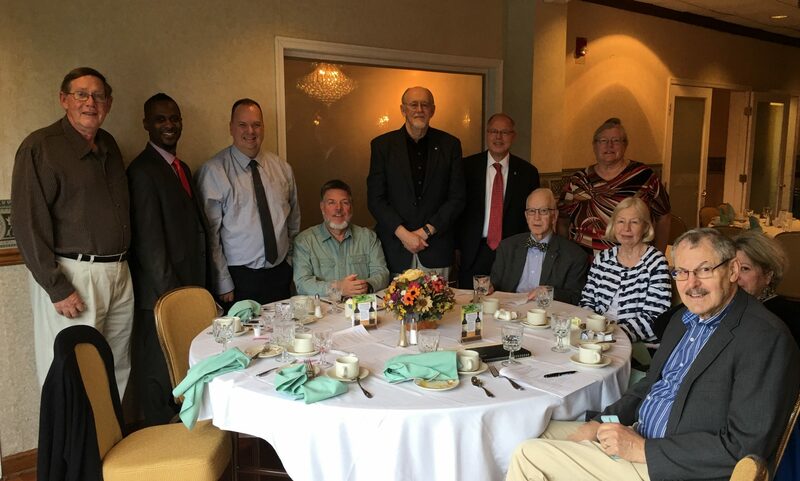 On Tuesday, 16 May, we gathered as currently serving and retired chaplains, chaplain assistants, and DREs. We met at the Fort Belvoir Officers’ Club overlooking the scenic Potomac River. This time there were no reported sightings of bald eagles, but routinely visitors to the area spot them either flying or perched in all their glory. We welcome all attending: Eric Wester, Gary and Susan Dahl, Donna Weddle, Dave and Janice Hicks, Demetrius Walton, Carleton Birch, Timothy Mallard, Wayne and Connie Ice with son, Wayne, Jane Heaton, Sherry and Jerry Reynolds, Bill Jokela and Randall Bowen. Due to travel or moves, we extended greetings and prayers for some not with us who sent word: Wayne Lehrer, Ben and Betty Nass, Rick Cantrell, Jeff and Monika Young (in Germany), Ivan Ives (in Oregon), Dennis Madtes (attending his youngest son’s college graduation in SC) Paula Wester (working at Walter Reed) and Ron Crews (relocated to Gainesville, GA). Chaplain Timothy Mallard, the garrison chaplain, welcomed our group and offered our invocation and prayer of gratitude for the meal. We enjoyed a bountiful buffet and got some updates. First, Donna Weddle, shared her grateful words for the enormous support and turn-out for the committal service to bury beloved Army Chief of Chaplains (MG) G.T. Gunhus on Friday, 28 April at Arlington National Cemetery. Also, Donna is a member of the National USACCRA Board, so she provided information about the hotel search for the planned Fall 2018 national USACCRA gathering. The 2018 USACCRA meeting is planned for the national capital region. Details about the gathering and our preparation and support will follow. 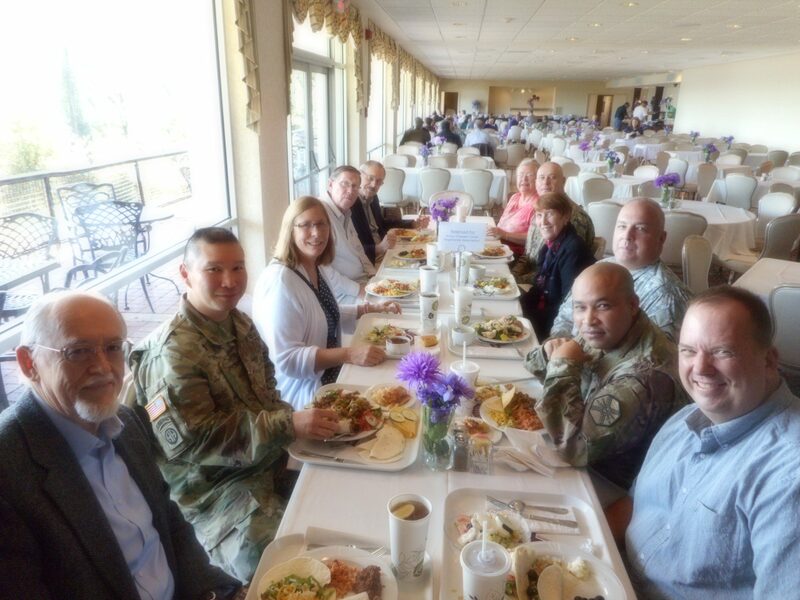 Chaplain Mallard updated the group on ministry activities at Fort Belvoir and emphasized the robust and diverse military mission and vibrant chaplaincy activities, including 10 different regular worship services, religious education, and other ministries. Finally, we noted the upcoming 242nd anniversary of the Chaplain Corps and planned observances. Additional information received on the day of the meeting announced a morning memorial service at Fort Myer, Arlington, VA, along with ceremonies at Chaplains Hill and the Tomb of the Unknowns. All of these activities will be Friday, 28 July 2017. Practicing and retired chaplaincy personnel will be welcomed at this event planned by the Military District of Washington. Next Event: Fort Myer, Friday, 28 July 2017 to commemorate the 242nd Anniversary of the Chaplain Corps! Watch for further details. Our group, at about 50% strength, met on Tuesday, October 11th at the Fort Belvoir Officers’ Club for our quarterly luncheon. 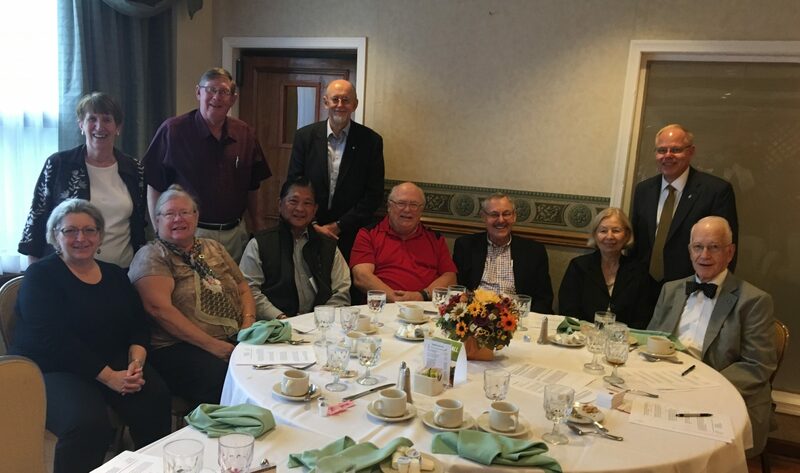 Our gathering included Bill Jokela, Brian Tung, Eric and Paula Wester, Gary and Susan Dahl, Wayne Lehrer, Rick Cantrell, Donna Weddle, Timothy Mallard, Pedro Reyes and Randall Bowen. 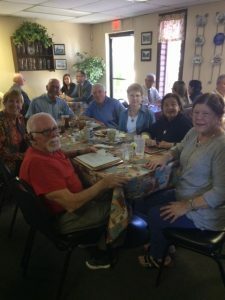 It was a great chance to reconnect to catch up on Summer travels and hear updates about ministry developments. We were especially blessed to have senior chaplains and the chapel NCOIC welcoming us and leading us in prayer. More than half of our group, however, were away and many sent greetings. For Ben and Betty Ness it was moving day to their new home, Renee Klish, Bob Richter, Dennis Madtes, Ivan Ives and Kristi Pappas all sent their regrets. Jeff and Monika Young and Jerry and Sherry Reynolds explained they are looking forward to the national gathering in San Antonio. Benchuck Manning was committed to a VA Hospital Pastoral Care luncheon. Doug Lee and Ron Crews were both traveling (to Hawaii and North Carolina), and David and Janice Hicks let us know they will soon depart for a visit with their son and family in England. Our Washington DC-area chapter of the USACCRA will be well-represented at the San Antonio gathering at the end of the month. And we will look ahead to our next gathering when we will reconvene in the new year with two dates set: Thursday, 2 February at Ft Myer and Tuesday, 16 May at Ft Belvoir. 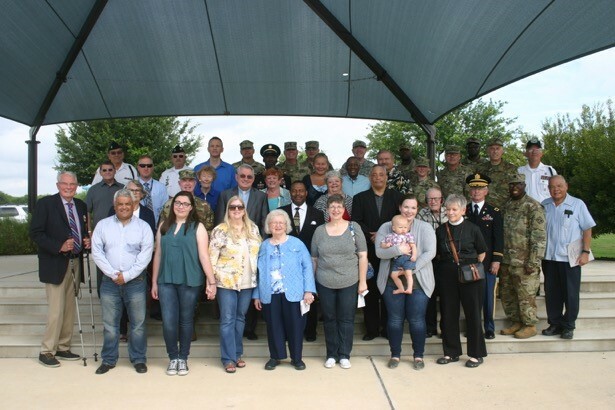 On July 29th the local San Antonio USACCRA Chapter sponsored a memorial service at Fort Sam Houston National Cemetery. This was the second annual service. Last year our first one was very small. We were thrilled to have such a great turn out this year. Each year we select a representative Chaplain and Chaplain Assistant who is laid to rest at the Fort Sam Houston Cemetery. We honor their memory on behalf of the thousands of Chaplains and Assistants who have served our nation from the American Revolution until today. This year our attendance was bolstered by a great turn out of active duty Chaplains and Assistants. Also, we were pleased to have family members of our two honorees, Chaplain Conrad Walker and SSG Manuel Barrera. We also received excellent support from the National Cemetery administration and the MSD organization.